Allaboutlimassol.com - Antonis Charalambous: The best out of 3000+ students begins his journey in Limassol with a €10.000 bonus! Antonis Charalambous: The best out of 3000+ students begins his journey in Limassol with a €10.000 bonus! “Does this mean I am actually the valedictorian in the entire CUT?”. He found it hard to believe, quite possibly because he never really aimed to it during these 4 years or maybe because he would wish to avoid speaking from the pedestal of the graduation ceremony, as he had been asked to. 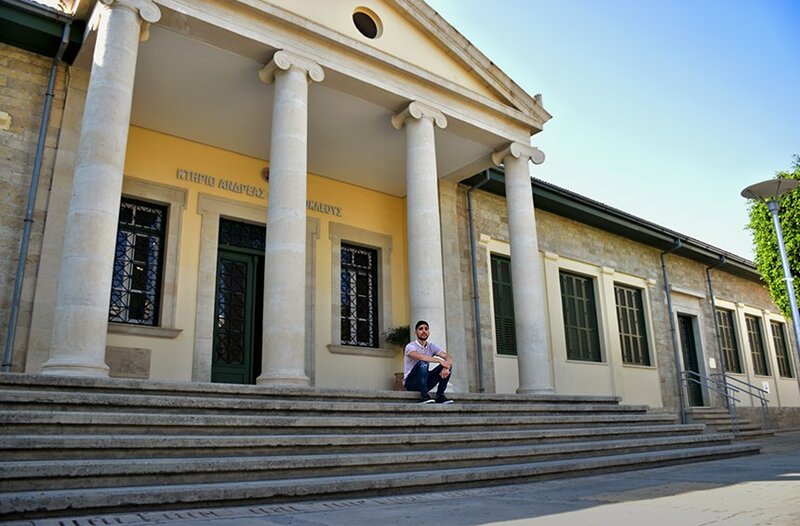 Antonis Charalambous, though, is indeed the valedictorian graduate student of the year 2016 – 2017 at the Cyprus University of Technology, a young man anticipating to build on all those things the University and the Limassol city had provided to him in these years. His bank account is considerably larger, after the €10.000 prize, awarded by the President of the Republic, as well 2 more, the award of the Communications and Internet Studies Department and the award by Cyta. He could have had made many choices. He could have had studied abroad or in another field. 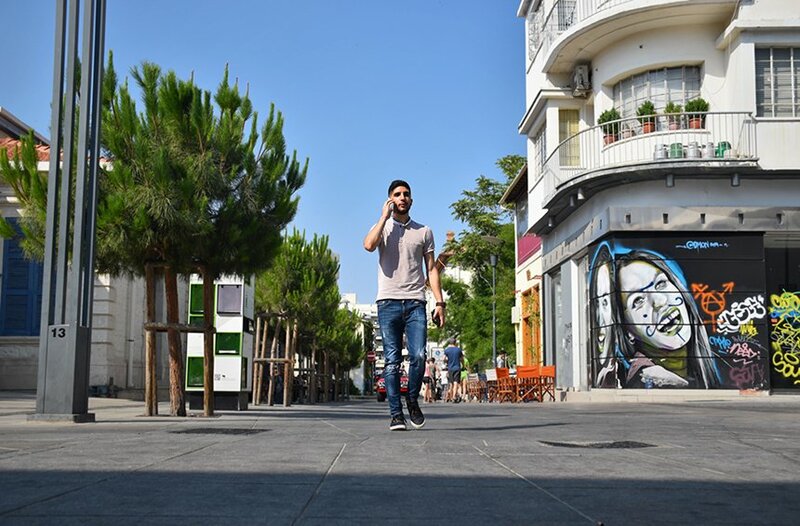 But Antonis, just like over 3.000 students, has connected his life with the CUT, spenging the 4 most amazing years of his life in Limassol. And he did not regret it a bit. "Limassol is a modern and developed city..."
Where you familiar with Limassol before coming to study? Not really. I had been here around 1 – 2 times, but I did not really know what to expect. It was a whole new experience. I did get to discover the city center, but not the suburbs. Would you like to travel outside the city for classes and get to know that part, too? Maybe I would be disgruntled if I had to travel too far, but if there were transportation services, maybe I could enjoy it. I am sure that there are quite nice places that I haven’t seen yet. On foot, I did not have a car in Limassol. The good thing with Limassol is that everything is in a 10 min. distance walk, if you are staying in the center and most students are. From Larnaca I would take the bus or ride in the car with friends. I like clubs and large parties in the university… Limassol has an intense social life, but I think that you can combine entertainment and studying. Did you have difficulty to fit in Limassol, in general? I do not think that fitting in the same country, with the same language and a similar environment could be difficult. Are there any differences between Larnaca and Limassol? Limassol sure is much more modern, more developed. Even in buildings. How do you feel about the area of the seafront? It has a great image, with a view to the sea you can sit and think. It relaxes you and you can put things in perspective. You are vegan. Did you get to cover these special diet needs daily? I found a lot of spots for this kind of food. Especially lately things are much better and I did find places with veggie burgers, such as Mamma Pizza, Pepe Burro. In general, I think that any place with burgers has a vegan version. I think that Limassol has a lot to offer in that area, especially around the city center. I mean for anything, that is, not just food. Was student life in Limassol good enough for you? Yes, even if it could improve it it was a bit more organized and hosted more massive events for the students. Do you recall some party very intensely? Some hungover maybe? What happens in Limassol, stays in Limassol… (laughs). Was there something that would distract you from studying? Fun, maybe, or flirting? Yes, that's exactly it... (Laughs). There were times that I wanted to quit studying, but another voice in me would push me to go on. You want to be worthy of people's expectations. Limassol has an intense social life, but I think that you can combine both fun and studying. Homework never kept my from going out. One should not expect from the university to get them to the point they want to be professionally. What it can do is help you find what you want to do. What is it that you remember more vividly out of these 4 years that makes you laugh? The moments with my best friend. It was the best thing that happened to me here. We had a great time. Do you remember something that you would wish had not happened? The music boite! Ah, people are going to kill me if they find out… (laughs). I do not want to sound mean but it’s not really my style. People at the university seemed to care a lot about that – they strive to invite people through Facebook, to set it up etc – while they would not do the same for other things, that bothered me. I would like it if there were other events, too. What would you like to have most? I like parties in clubs, the massive parties in the university with lots of people. Yes, I kind of missed not having that so much (laughs). Maybe I would like it, if there was a way to have such events taking place here and to be able to find out about them. Do you have any favorite clubs in Limassol that you are going to miss when you go back to Larnaca? The 7seas is a favorite. Especially on Wednesdays with the established ladies nights, when many ladies are around (laughs). But, it was also very convenient, because it was nice to go out on Wednesdays and have a break in the middle of the week. What other favorite spots of yours are there? Out of the coffee shops I particularly liked the one "Sto Dromo" because it feels traditional, you would not see people on their mobile phones, they would talk more and I liked that. Makariou also had many nice cafes. "It is an advantage to be in a public University…"
You were considering the UK for studies, too, but you chose Limassol after all. Yes, I find it hard to get out of my comfort zone and I do not really risk that much. So this option would fit me. Were there other advantages in the fact that you came in Limassol to study? Yes, it is an advantage to study in a public university, which obviously does not burden the family financially. The university in general did teach me a lot. It helped me grow. Would you recommend the CUT to someone who graduates high school now and wishes to do something with web developing? The school may be more suitable for someone who is interested in marketing or journalism. But, if you do not check out all your different options, it is hard to make up your mind. And if you want to work on yourself in general, this option is the best, because you get a lot from this school. Are there disadvantages in studying in Limassol? I did miss the feeling of a campus, an area where you can meet up with all of your fellow students. I did not get to see them, except from some accidental moments. It feels weird not to be close to your fellow students. 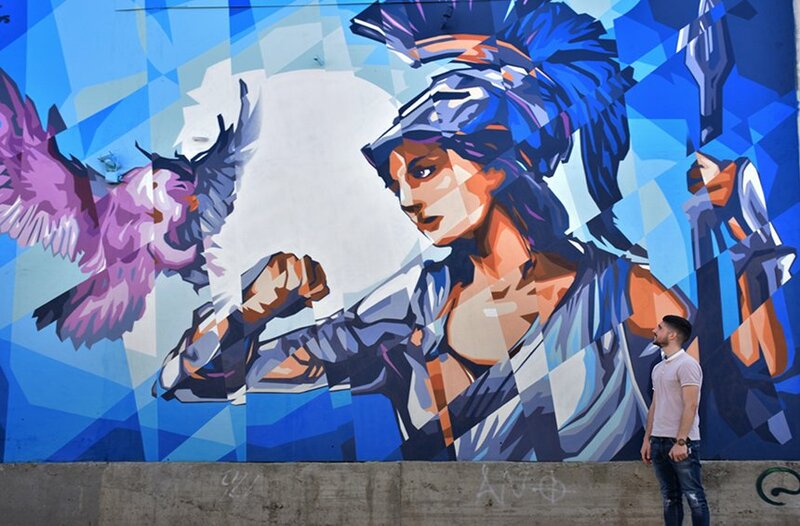 "You learn to open your mind, to doubt, to be curious"
For the past 4 years you have been a permanent resident in Limassol? Yes. I was staying in a small studio at Heroes Square. I stayed in the same studio for 4 years, I did not research a lot, but I chose it because it was in a reasonable price. If I had to choose again, though, I would look for something larger, because the studio was too small and you get to spend a lot time in it. Well, I did not really study that much. It is important to be concentrated during the class. Personally I did not do that much work by myself, but I would pay attention in the classroom. Does that mean that the teaching was really that good? Yes, the teachers were top in our department. Even if the classes were not always of my particular interest, but I always learned something. I did sociology, psychology classes, I learned a lot, how to think with open horizons. Did you know that you would have such classes? I did check out the description and it did say that I could work as a web developer, so I thought I would like something like that. When I started the school, I had to do more classes, until we would specialize in my field. Did you feel like the curriculum was helpful, after all? If I had to choose again, I would probably go for something more specific. On the other hand, if I had not tried so many different subjects, I wouldn’t have found what I like the most. When I started, I did lots of different classes, like marketing, sociology, even my fist class for web developing. That’s when I thought that this is what I should do, I realized that web developing was my thing. Maybe, if I was in another school, I would of never have known that this is what I like the most. After all, even in classes that were not really that interesting to me, the teachers were always working hard to teach you. They would give us lessons on how to have an open mind, to doubt, to be curious. I think that the teachers made them interesting. The wanted to hear every opinion and make you see all the different sides of a subject, in order not to accept everything as a given. Limassol is really nice. It could even be nicer, in another phase of your life. Maybe i would stay permanently in Limassol in the future. Do you remember something in particular from the classes? Well, there were a lot of nice subjects to discuss in the university. For example, adult movies or women issues and the way they are represented in the Media. And that was really interesting, because we would listen to different opinions, from the most traditional to the most progressive ones. At first, when we were all together – up to 50 people – in a class, these talks were very interesting. Did you get to meet any foreign students? Yes, our department we would host Erasmus students every semester, from various countries, like Belgium, Denmark, the Netherlands. It was great. We would go out together ant I was surprised by how open they were. What was their view of the university and the classes? I think it’s the same I mentioned before: the classes teach you that there is not just a single way of seeing things, that you should wonder, to research. No matter the class, they would always push it a bit further. In general, I think that Limassol made a great impression to them. Did you think of undergraduate studies in the CUT, too? I did apply and I was accepted, but I did not want to rush into a new circle of studies again. I’d rather practice in the field more. Would you stay to work in Limassol? Yes, if I had an offer that I would be interested too. Limassol is very nice. At another phase of my life, it could even feel better. Maybe, for a student, a walk at the seafront is not really much, but it could be different later. I could live in Limassol on a permanent basis. And what about after the degree? I started working in the beginning of the month on an EU funded program running in the CUT. It is called VAA and basically it is a platform that assists people to choose what they should vote, to understand which candidate would represent them the best according to their beliefs. In fact, I handle the data the come from the system. How long will you be in this? I do not know exactly. My main concern is to collect experiences and knowledge, I do not really mind the money right now. But what you get can cover the summer cocktails, right? Are you considering research on your field or is this something that does not concern you? I like programming actually, to work on applications. I do appreciate research of course, I had great teachers and I did several classes about research methodology and I know it is important. Have you thought about your future steps? Actually, I had to do some training and I did work in a company related with programming. I found out there about some exams that you can pass and I studied through the summer to sit on this test. You always keep going, you never stop with the university classes. I try to obtain as much qualifications as I can. How did you find out about these options? When I was a trainee I talked to some people in the company and they advised me on what I could do. Most of the people working there come from the informatics field and in order to be competitive, you should do a lot of extra things on your own. You mean that not even the valedictorian is able to get the job of his dreams? Not at all… (laughs). If i had this mentality, I would be really down right now. If I expected to do what I love right after I graduated, reality would really crash me. I had sociology, psychology, I learned to think more open... if I was anywhere else, maybe I wouldn't have discovered what it is that I like the most. If you could change anything from this entire experience, what would that be? I think that what matters the most is how I handled it, not the circumstances. The important thing is to do the best with the cards you were dealt with. So, what do you keep after these 4 years? I would say that one should not expect from the university to get them to the point they want to be professionally. What it can do is help you find what you want to do. Many people expect to graduate and be at the point they always thought their life would be, but they are barely still in the beginning. There might need to be 5 or 6 years after you graduate to go through all the stages to get to your goal. They teach you that there in not a single way to view things and that you should wonder and research. I don’t think that the university is supposed to get you ready to do your dream job. Yes, you are in a good place when you graduate, but you need work further on. Many people are disappointed because they don’t get a job they like as soon as they leave the university. You need many years to reach to an ideal point, so it’s good not to get disappointed. Antonis did not really have many expectations from his school or the city he chose to study in. The financial reward he received 4 years later is merely the material benefits he got out of his course. 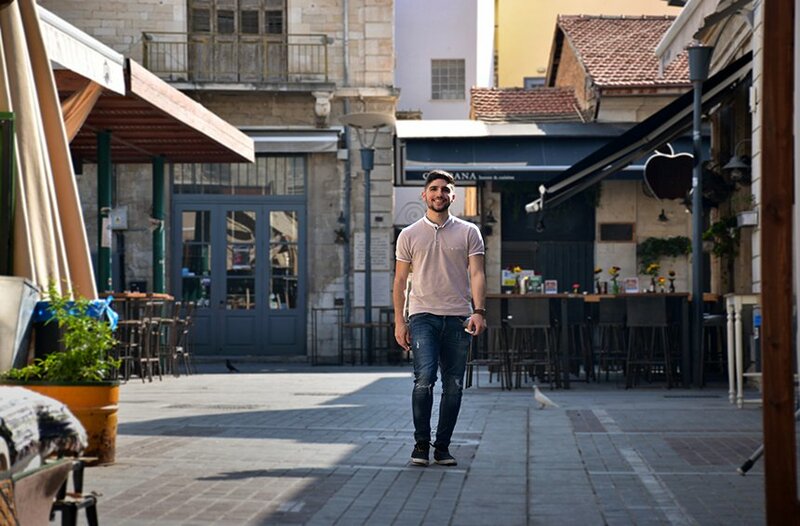 But actually, the experience of his student life in Limassol counts many more: strong relationships with people, a mature and overall approach for his journey towards knowing the world, a deeper understanding of his goals from now on, both in his personal and professional life. And, after all, the money of the prize will eventually go away, but knowledge – and just the one from books – is a magical material that actually increases as you use it. * We walked with Antonis through the alleys of the old town, down to the seafront, while talking, and our steps led us to the Old Port. Limassol is a true inspiration for a nice walk and talk, after all. The best part was that you can always end up in a captivating location with amazing cocktails, like Gin Fish, to chill and enjoy the amazing view.